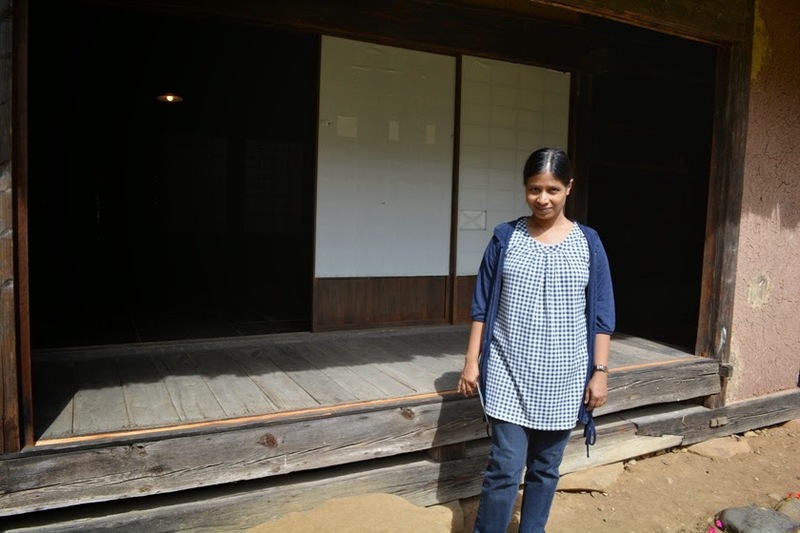 As I have written in the previous post, hubby and I visited Michinoku Folklore Village on 23rd September, 2013. Michinoku Folklore Village (Michinoku Minzoku Mura in Japanese) is an open-air museum located in Kitakami City of Iwate prefecture. 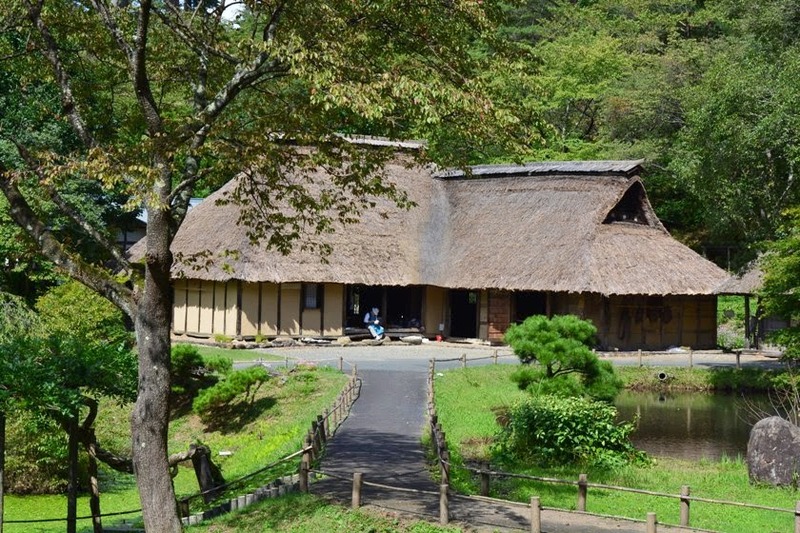 The museum exhibits twenty-nine preserved and restored historical structures like farmhouses, merchant-house, Samurai-style houses, and other buildings belonging from the feudal Edo period up to Taisho period. 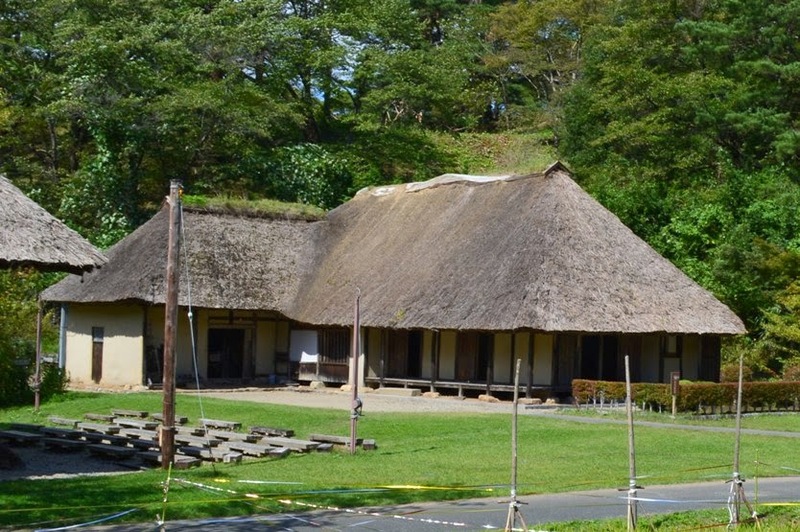 These historical buildings were removed from their original locations in the Tohoku region, and relocated, reconstructed and exhibited in a scenic open-air museum park in the hill and valley of Kitakami River Basin. The restored buildings are arranged around the park amid forested walkways, ponds and fields. 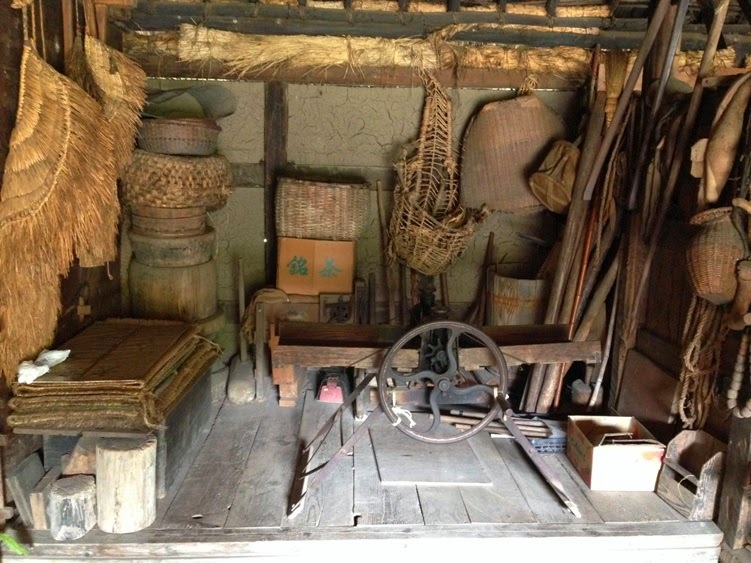 Visitors can enter most of these buildings and see the display of various household items and tools that offer a glimpse into the traditional lifestyle of local people who once lived in the Tohoku Region. In the last post, I wrote that hubby and I walked along a paved pathway inside the open-air museum, and enjoyed viewing several old buildings. In today’s post, I will write about the remaining historical buildings that we visited in this museum. 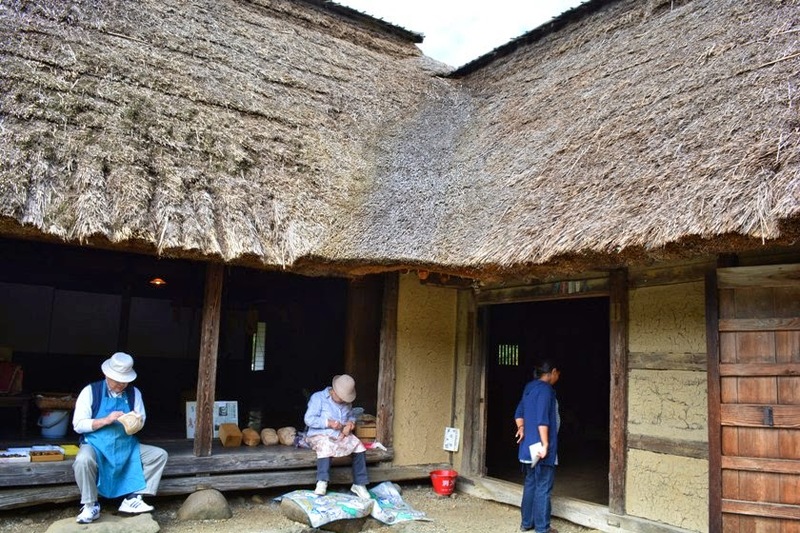 From Sugawara Family House described in the previous post, we continued walking along the paved pathway in Michinoku Folklore Village for about 5 minutes, and reached another old historical building also named ‘Sugawara Family House’. Its formal name is ‘Kyu Sugawara Ke Jutaku’ and it has a huge gate at the entrance area named ‘Nagayamon’. The building was originally located in a place called Usuginu in Kawasaki-cho of Ichinoseki City in the southern part of Iwate prefecture. It was constructed in the middle of Edo period. 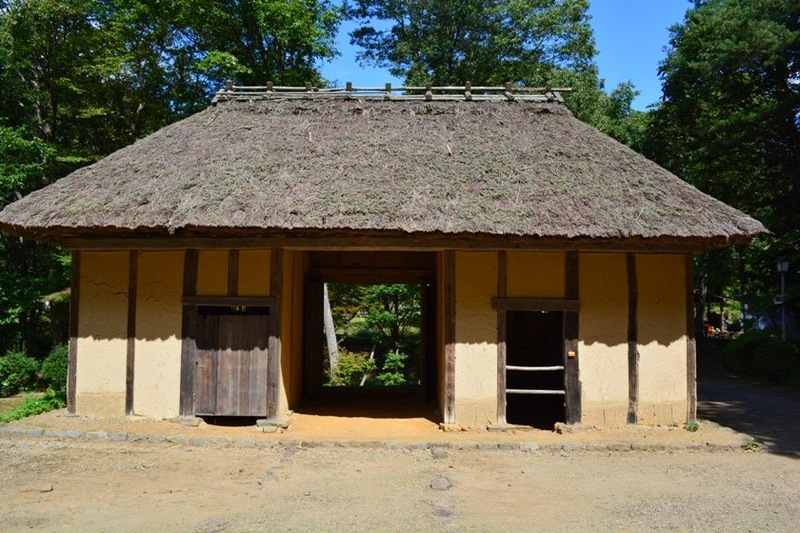 The building and the gate have been designated as the cultural property of Kitakami City. 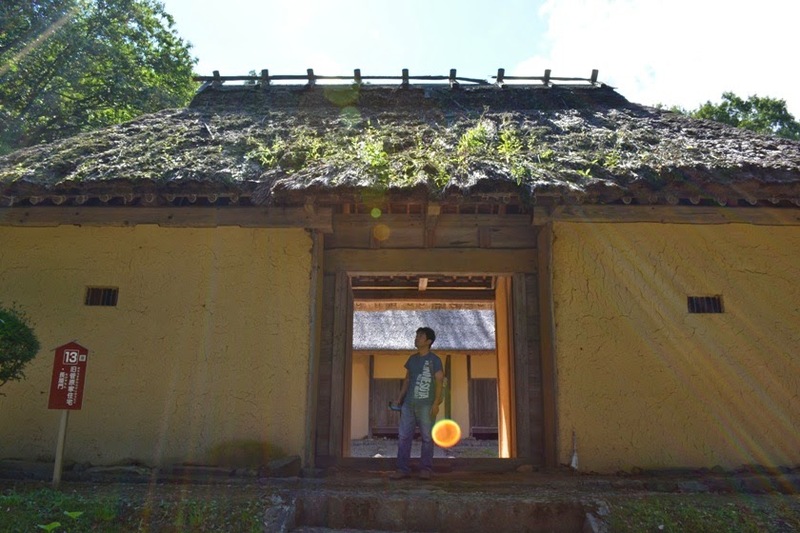 Sugawara Family House is a typical upper-class farmer’s house of feudal Date clan (Sendai Domain) from Edo period. Sugawara Family’s former family-name was ‘Miura’, and the house was known as ‘Saga Mine Yashiki’ during the Edo period. 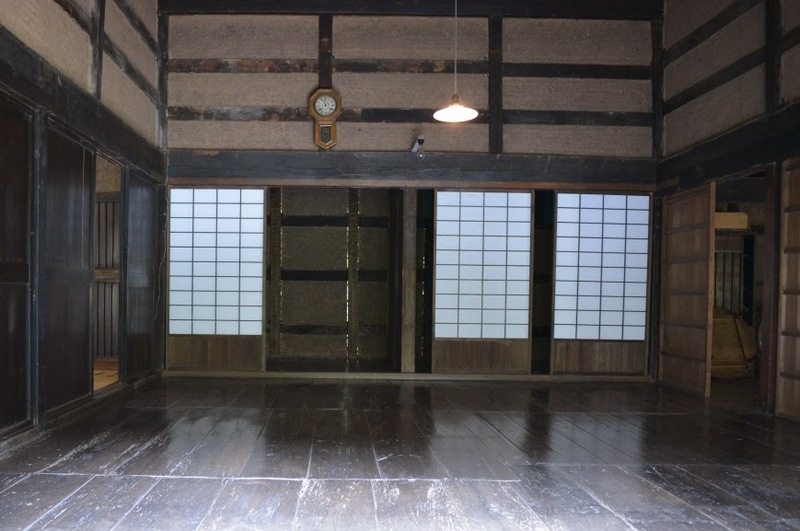 The house has a floor space of 59.4 Tsubo (196.4 square meters). During the olden times, gold dust was obtained from the soil of this house, and so the house had a Shinto shrine named Kinu Jinja. Kinu, also pronounced as Kin-Karasu or the ‘golden crow’, is a sacred bird that symbolizes the sun in Japanese mythology. 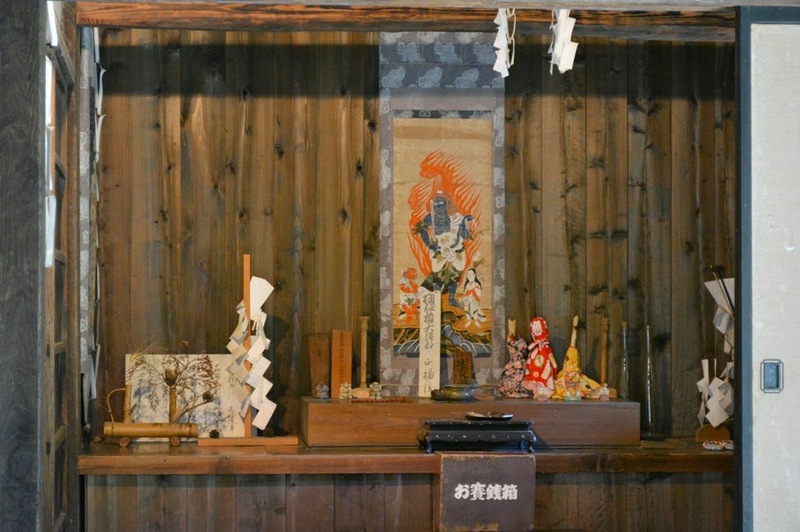 It is said that many worshipers visited this shrine located inside the house. Nagayamon Gate located in front of the Sugawara Family House is a very common type of gate of Date clan Sendai Domain from Edo period, and it has a floor space of 15.4 Tsubo (50.9 square meters). We loved viewing this house and the gate. 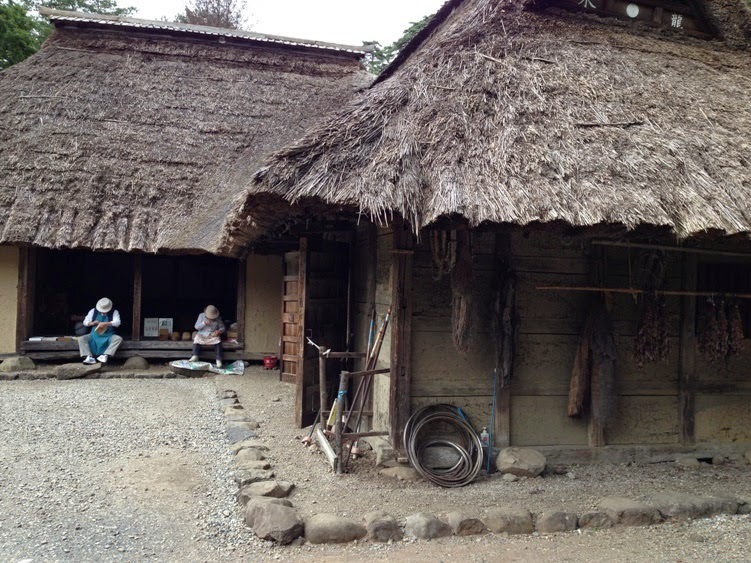 The house allowed us to experience the traditional home of a farmer of Date clan from Edo period. 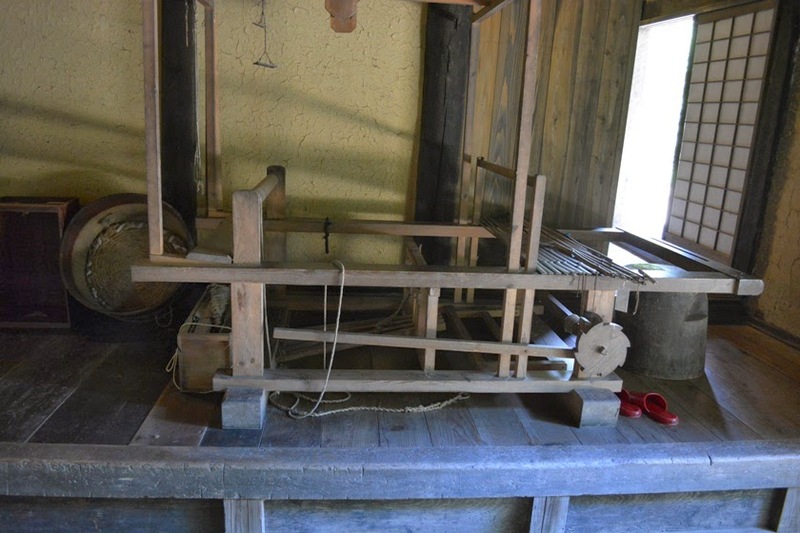 Inside the house, we saw a weaving loom and a winnowing machine in one of the rooms. 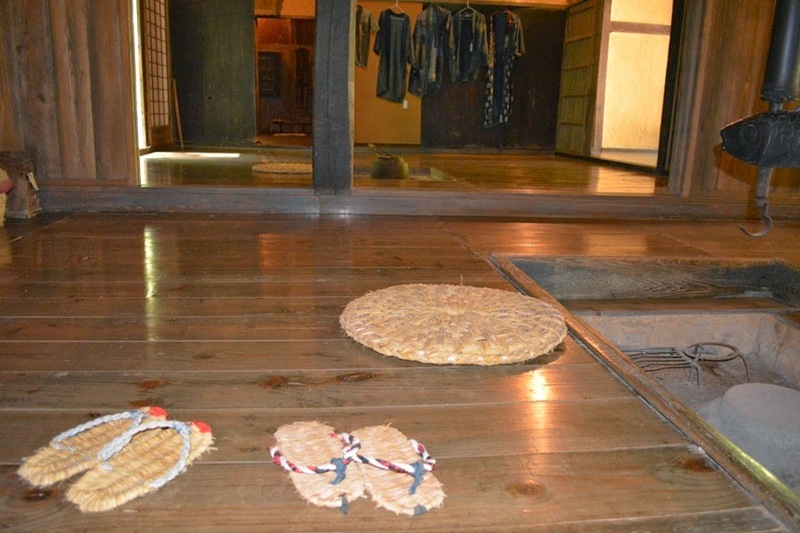 We also saw Zori straw sandals and a traditional sunken hearth named Irori in another room. Traditional clothes of farmers hanging in yet another room looked so interesting. We loved this house and spend quite some time viewing the architecture of the gate and the building, as well as all the artifacts kept inside the house. We took several photos of the house. Next, we walked along the paved pathway for about 1 minute or so, and reached another old building named ‘Kyu Sasaki Ke Jutaku’ or the ‘Sasaki Family House’. The building was originally located in a place called Shibutami in Daito-cho of Ichinoseki City. It was constructed in the middle of Edo period. 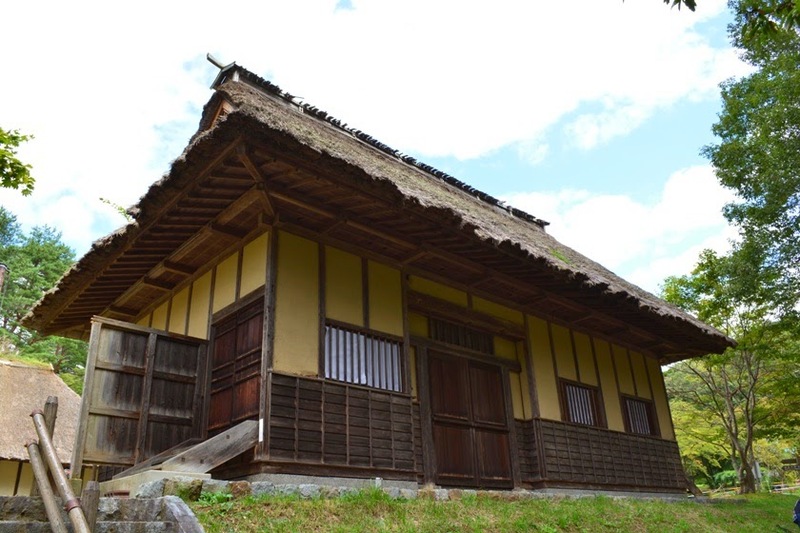 Sasaki Family House is a small private house of a farmer from Date clan (Sendai domain) of Edo period. The house has a floor space of 37 Tsubo (122.3 square meters). Sasaki Family cultivated tobacco leaves. To properly dry the leaves, the house was built to be well ventilated with few partitions. It is said that the tobacco cultivation in Date clan Sendai domain began when Hasekura Tsunenaga went on a diplomatic mission to Rome and brought back the seeds of tobacco to Date clan. 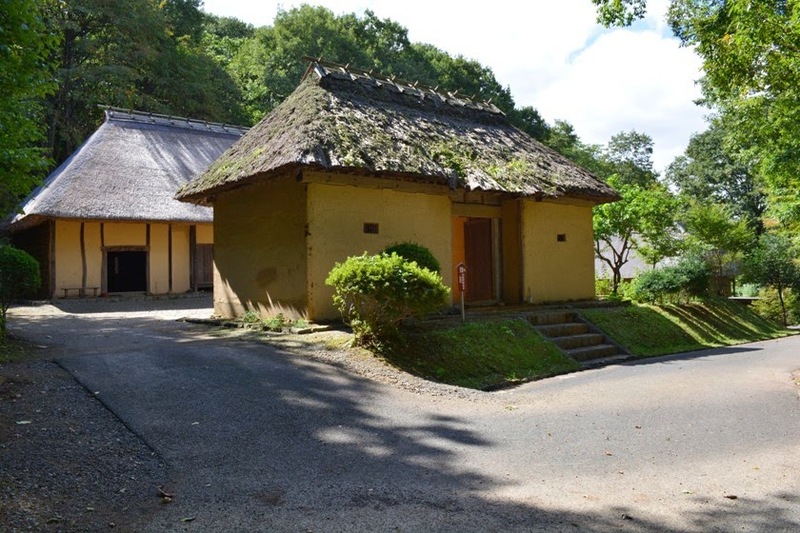 Sasaki Family House has been designated as the cultural property of Kitakami City. We loved viewing the building and took a couple of photos. We continued walking along the paved pathway and saw a small Shinto shrine with a god named ‘Komagata Kami’ enshrined inside. 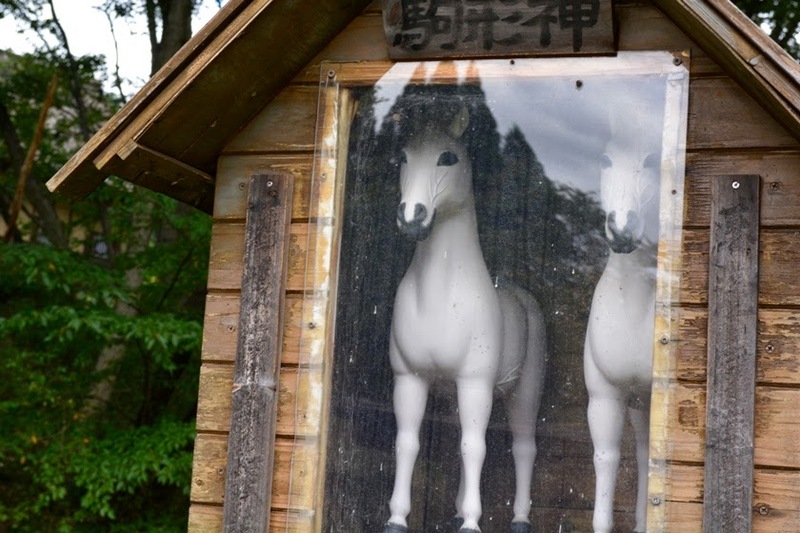 This god is considered to be the guardian deity of horses. During olden times, farmers prayed to the enshrined god for the safety and preservation of their horses. We walked along the paved pathway for another 5 minutes and saw a building named ‘Kyu Onodera Ke Jutaku’ or the ‘Onodera Family House’. The building was originally located in a place called Arakida in Hachimantai City. It was constructed during Meiji period in 1901, and has been designated as the cultural property of Kitakami City. The shape and structure of this building is long and narrow, which is unlike the houses of the southern part of Iwate prefecture. The house has a floor space of 67.14 Tsubo (221.95 square meters). The characteristic layout of the house is unique and the interior is very wide. 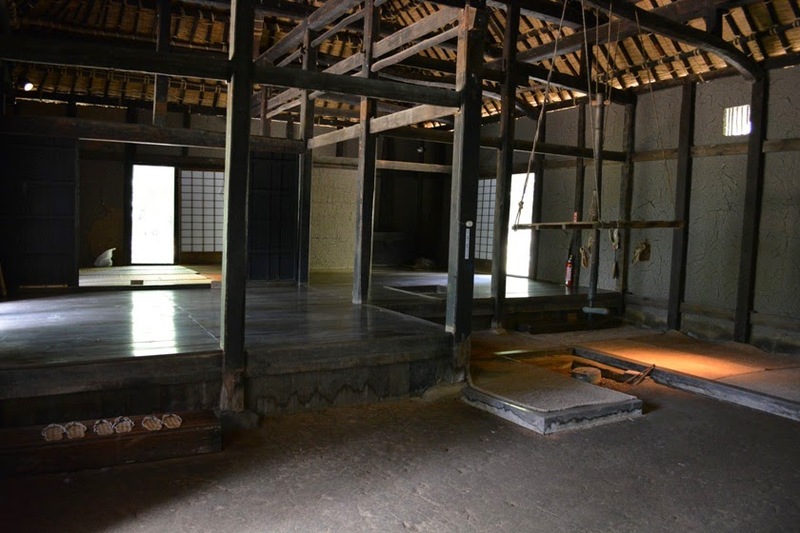 Joui-style living room (superior but lower grade than Zashiki-style living room), kitchen, Doma earthen-floor room, and horse stable room are all lined in a row. 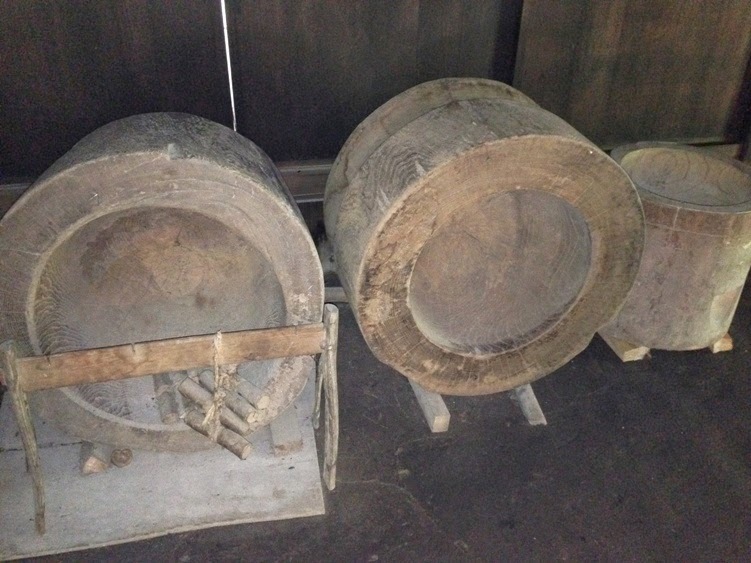 There are Irori hearths in the kitchen and the living room. In the Joui-style living room, the layout of sitting positions of people is very strict. 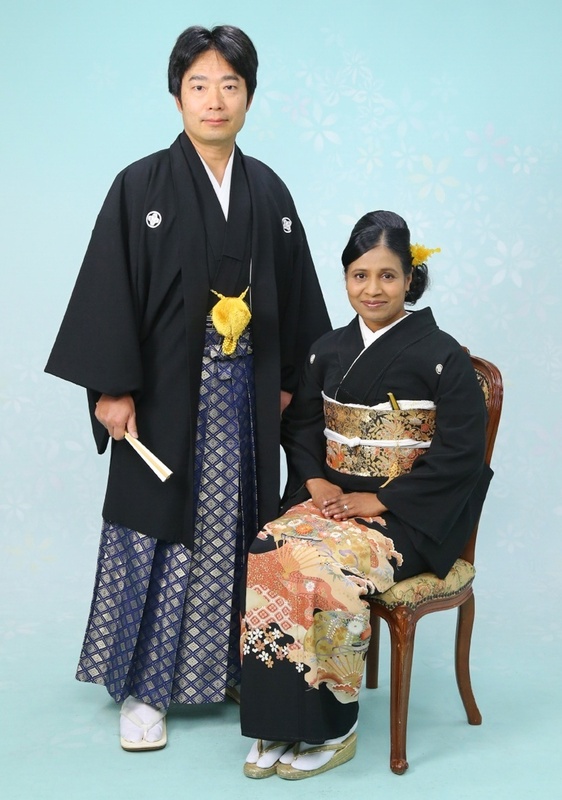 The sitting area of the head of the house is called Yokoza, his wife’s sitting area beside him is called Kakaza, and opposite of Kakaza is the sitting area called Kyakuza for guests. We loved viewing the building architecture. 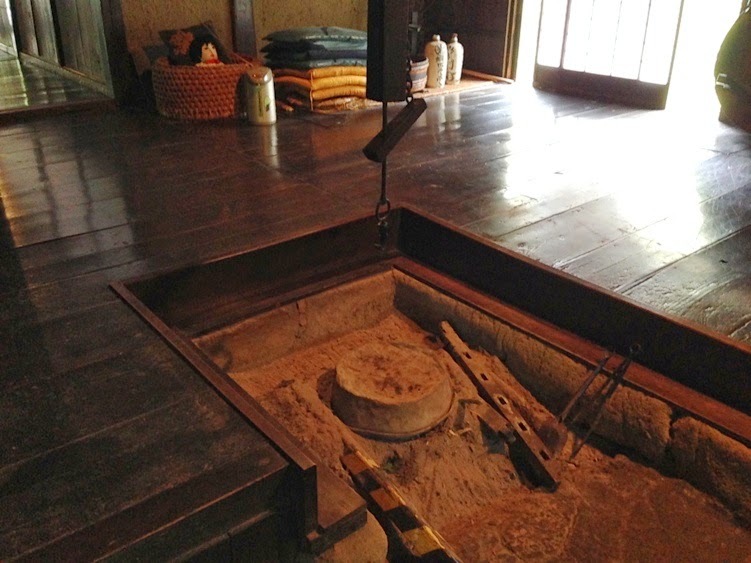 Inside the house, we saw Doma earthen-floor room with a Kamado stove, a room with Irori hearth, and another room with a pendulum clock. We took several photos of the building and the artifacts kept inside the house. Next, we walked along the paved pathway for about 50 meters and reached a small building named ‘Mase Koya’ or the ‘Mase Hut’. 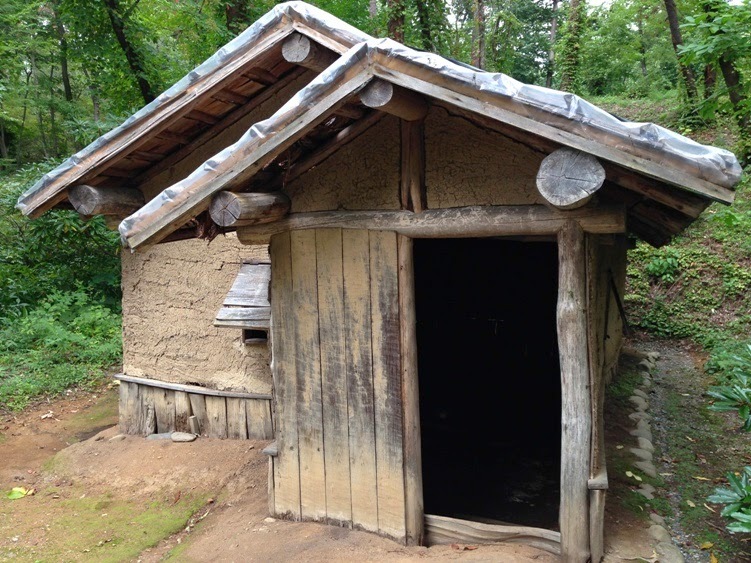 This small building was originally located in a place called Tachibana in Kitakami City. It was constructed during Meiji period in 1876. 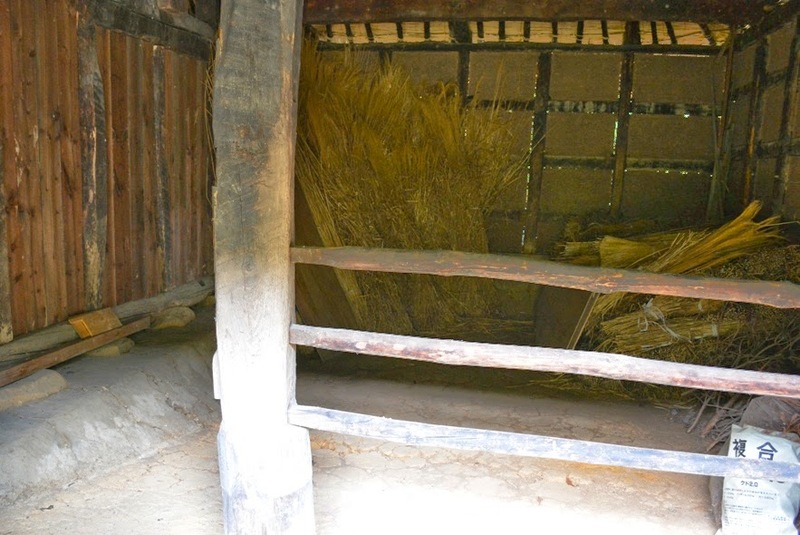 This hut is a thatched roof structure with the walls made of wooden-slat laths. 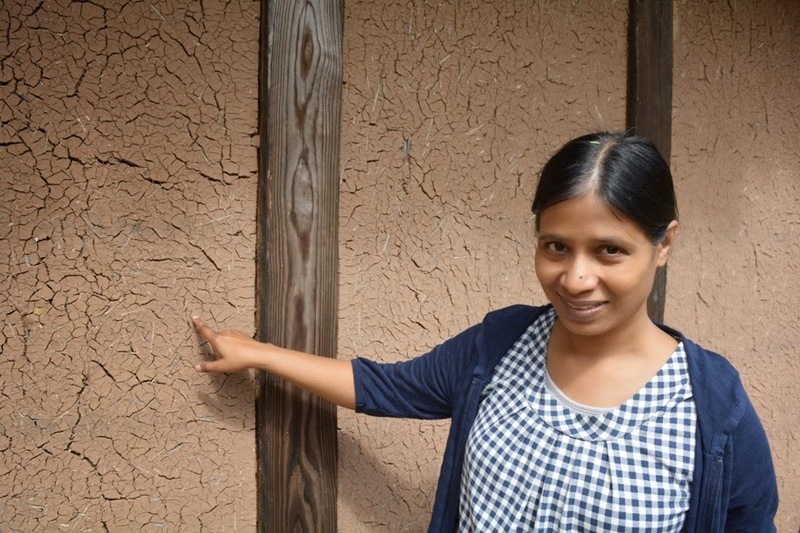 The wooden-slat laths are placed as far apart as possible for the purpose of ventilation. 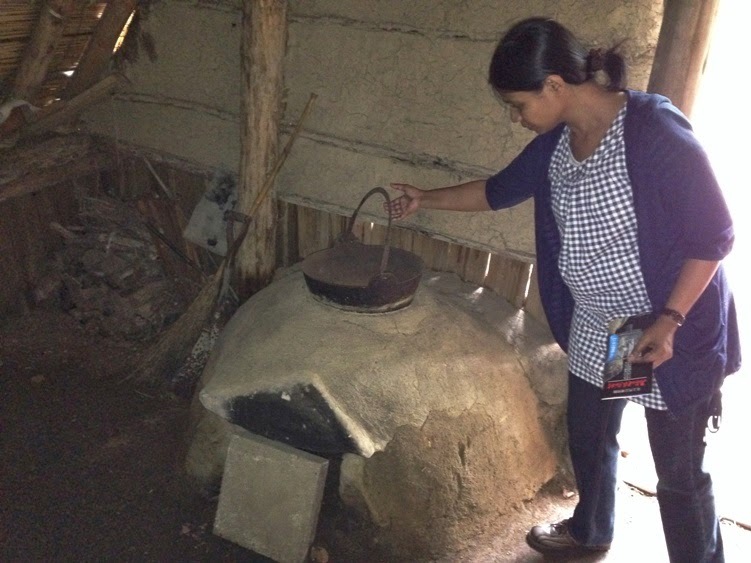 This hut was used for drying wheat, millet, rice, and beans, and also for threshing. 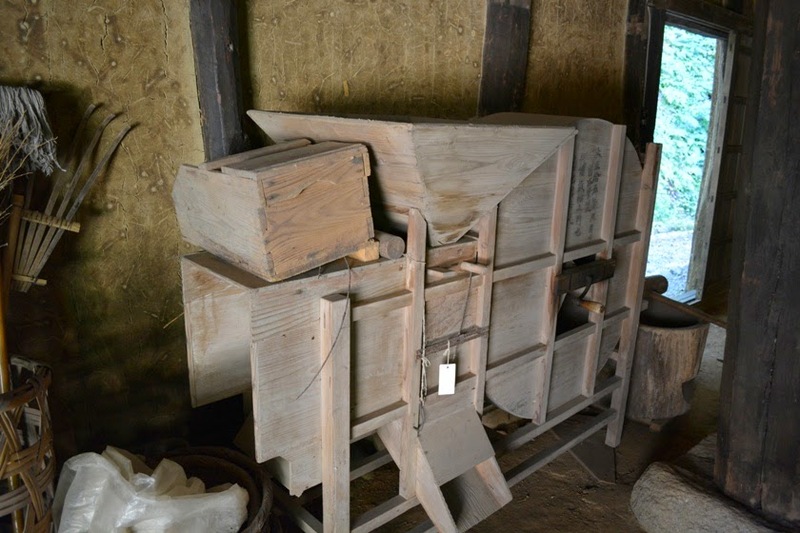 Many winnowing and threshing machines are kept inside the hut. 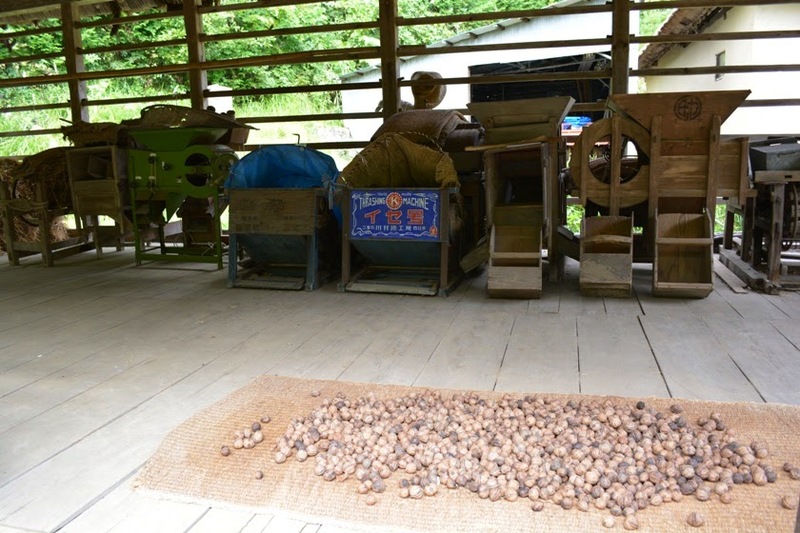 Millet seeds are being dried in the foreground of the photo. 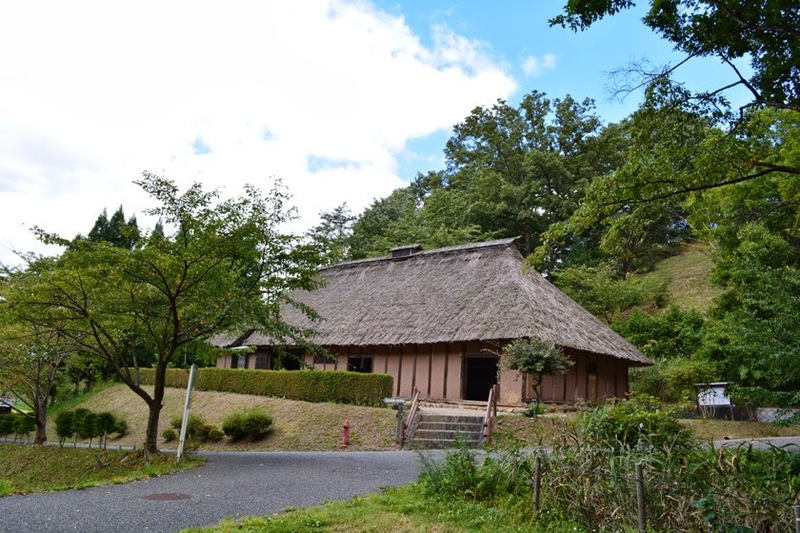 Adjacent to Mase Koya Hut, about 25 meters to its northeast, we saw yet another old building named ‘Kyu Kitagawa Ke Jutaku’ or the ‘Kitagawa Family House’. The building was originally located in a place called Tsuchibuchi-cho in Tono City. It was constructed in the middle of Edo period, and has been designated as the cultural property of Kitakami City. 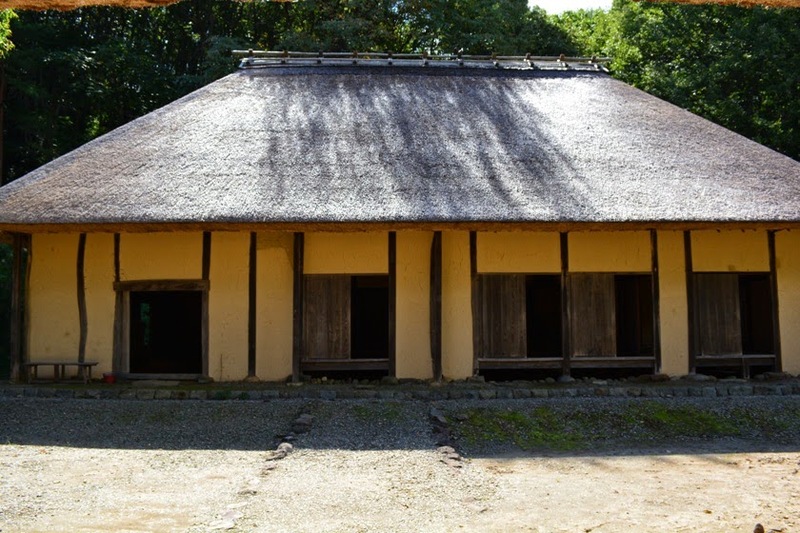 This building is L-shaped, and such a unique construction style is known as ‘Tono-Nambu Magariya’ or the ‘Tono-Nambu Bent-House’ (Tono-Nambu is the Tono branch of Nambu clan Morioka Domain). 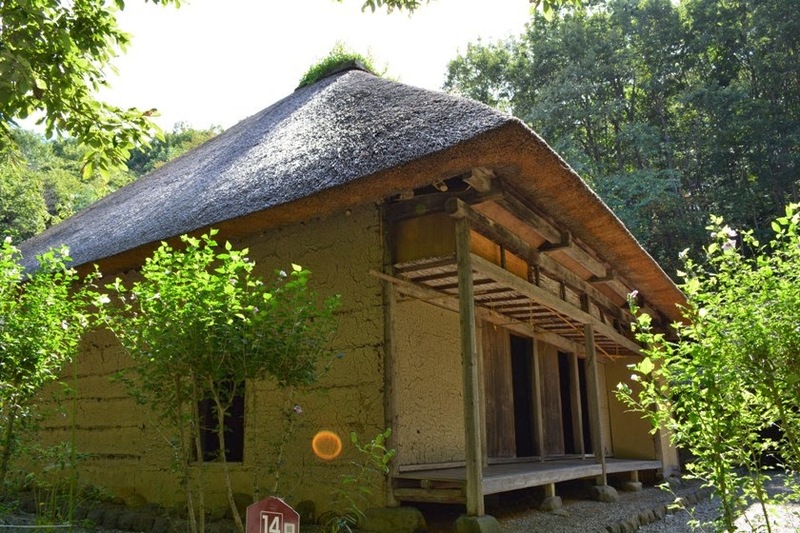 Such farmhouse building structure was the characteristic of Tono City and its surrounding area in southern Iwate prefecture during the Edo period, and has now become the area’s signature architecture. 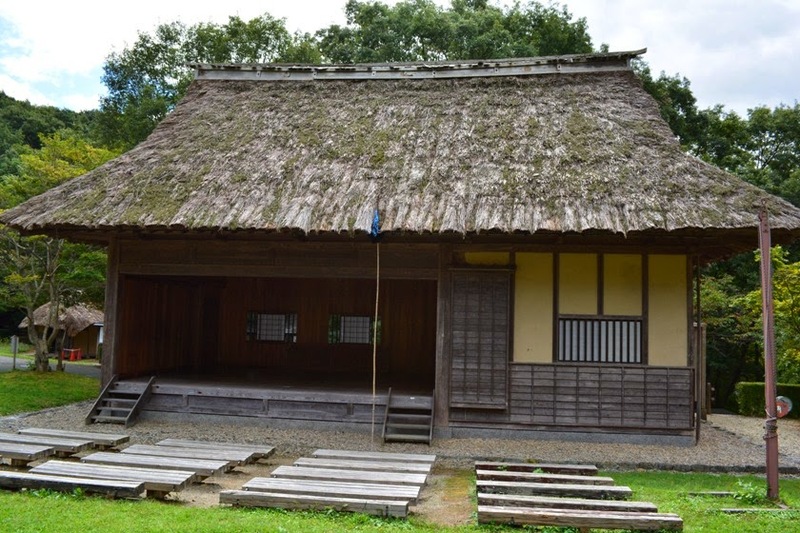 This building is divided into two parts, namely Shimote and Honya, which are connected at right angles to each other. 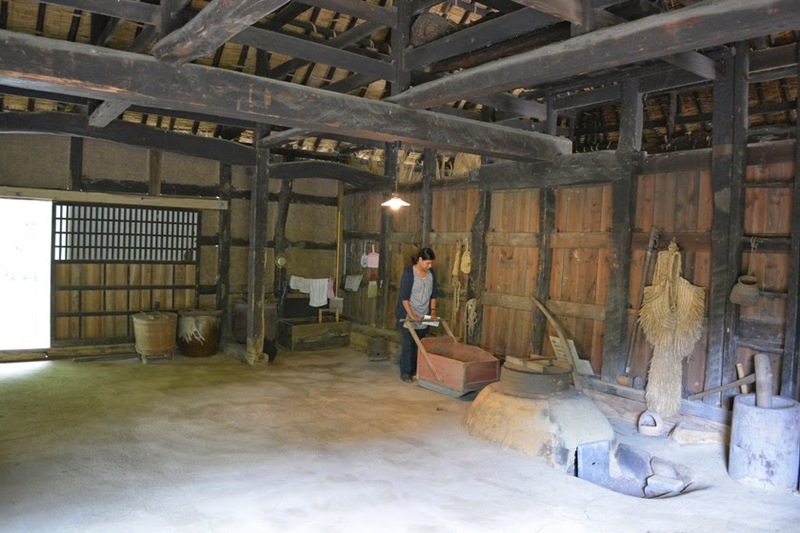 Shimote consists of a horse stable room and Doma earthen-floor room. Honya is the main living area of the house. 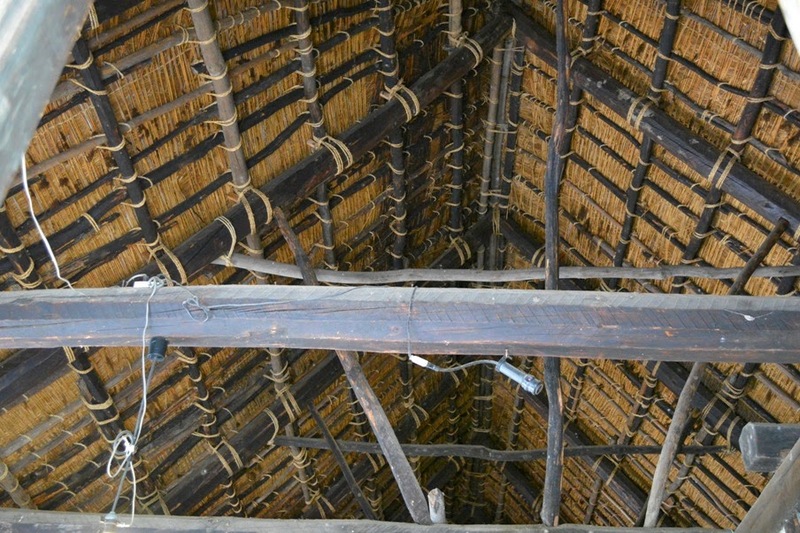 The roofs of both parts of the building are thatched and the ridges are linked. 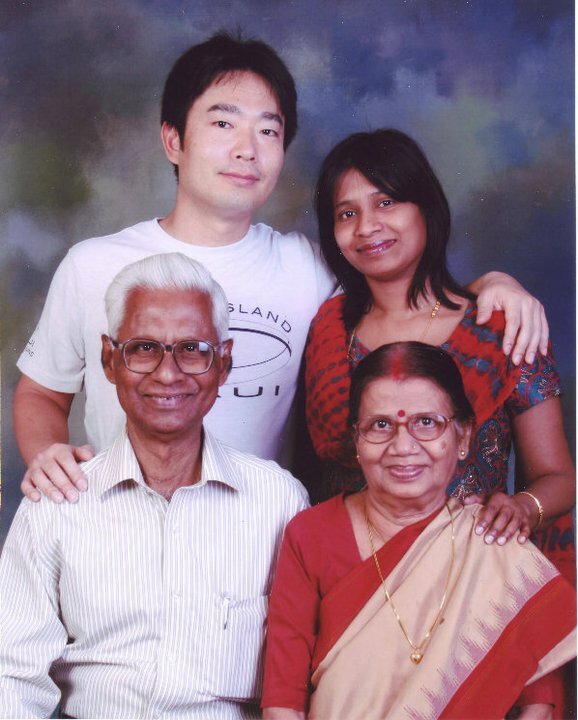 Kitagawa Family worshipped a deity named Oshirasama in their home. 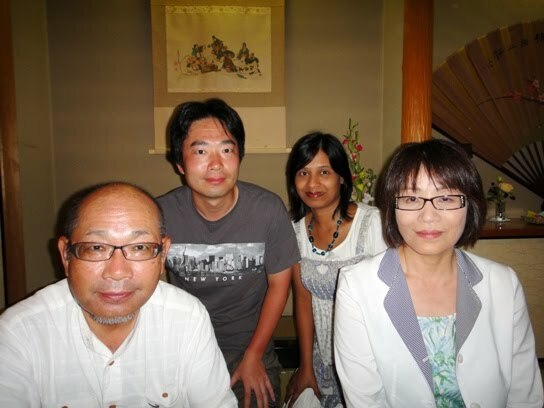 A scholar named Yanagita Kunio wrote ‘Tono Monogatari’, which is a book record of folk legends gathered in Tono City. This book mentions about Kitagawa Family and their worship of Oshirasama deity. We loved viewing the striking L-shaped architecture of the building. 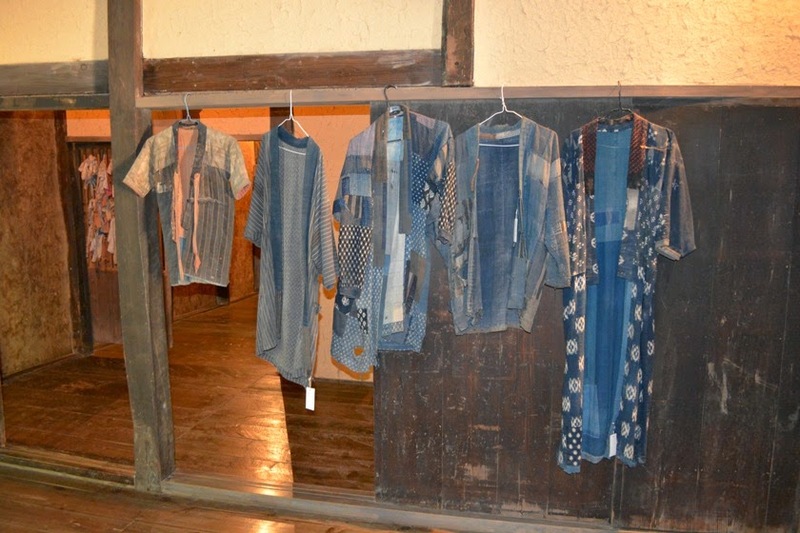 Inside the Shimote part of the house, we saw a Mino straw coat that is worn during the winter season. 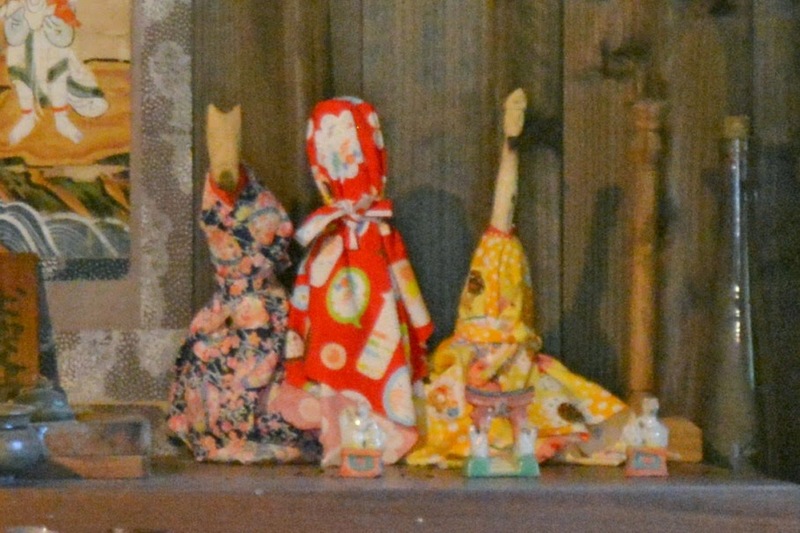 In the Honya part of the house, we saw an altar of Fudo-Myoo and Oshirasama dolls in a room. 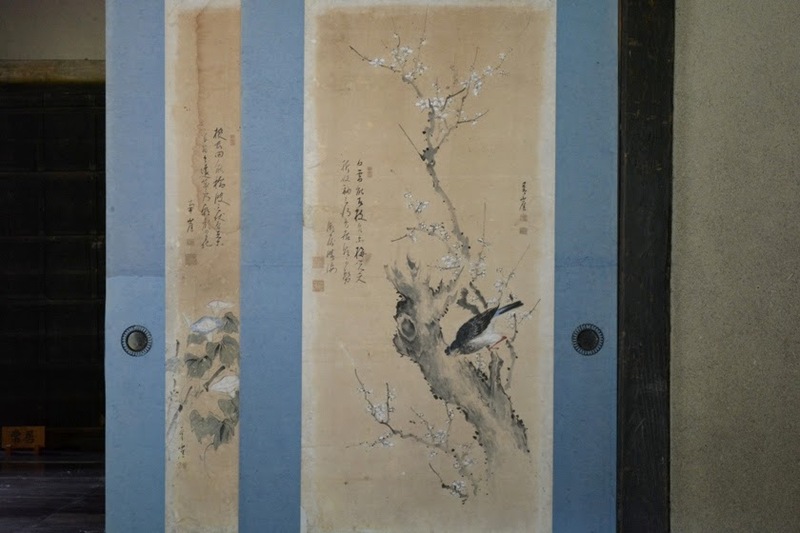 The artwork on Shoji sliding doors of this room seemed fantastic. We took several photos of the building and the artifacts kept inside the house. In front of Kitagawa Family House, about 15 meters to its south, we saw a huge gate named Nagayamon. Its formal name is ‘Nagayamon Fu Enbujo’. This gate is actually the replica of the original gate of Kitagawa Family House. This type of Nagayamon Gate was very popular in Date clan Sendai domain but was not so popular in Nambu clan Morioka domain, though a few existed in Tono-Nambu area. Presently this building is used as a theater for various performances. We took several photos of the gate from various positions and angles. The gate as viewed from the north (backside). This gate is now used as a theater and so a few wooden seats are seen in front of the gate. We continued walking along the paved pathway and reached another building named ‘Kyu Hoshikawa Ke Jutaku’ or the ‘Hoshikawa Family House’. 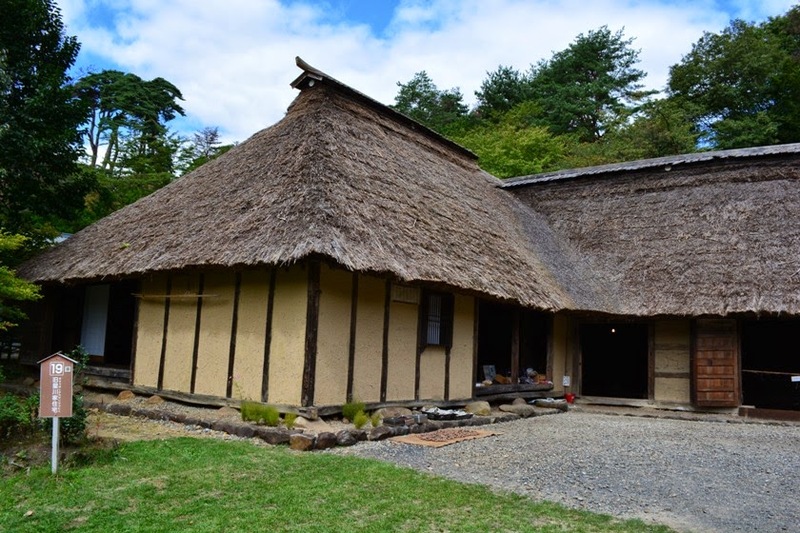 This building was originally located in a place called Kita-denpoji in Yahaba-cho of Shiwa District. It was constructed in the end of Edo period, and has been designated as the cultural property of Kitakami City. 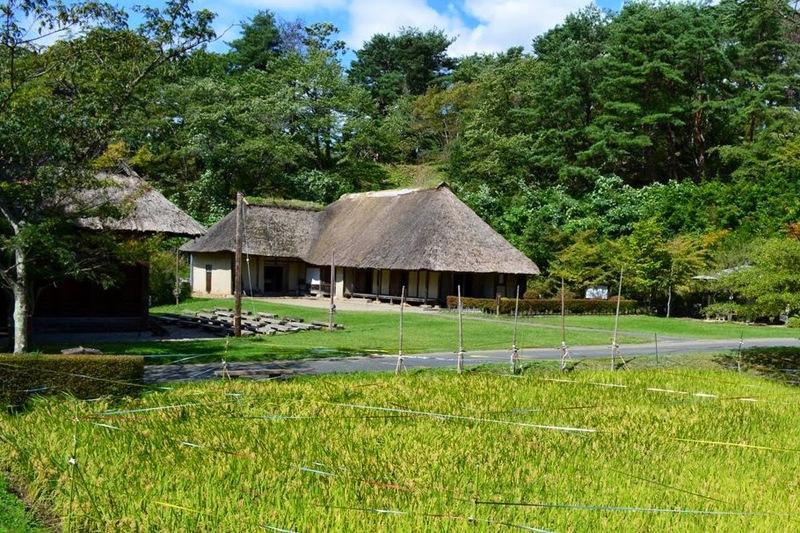 Hoshikawa Family was a small-scale farmer and the farmhouse was located at the central area of Nambu clan Morioka domain. 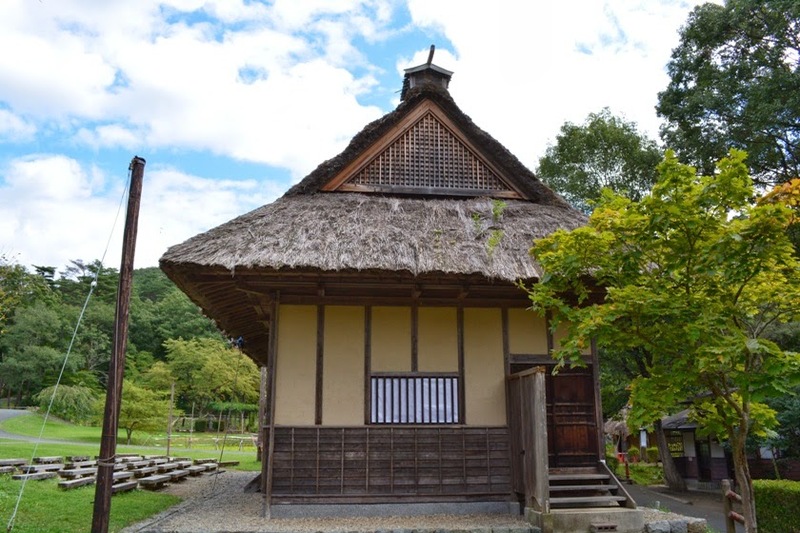 This building is L-shaped and its construction style is known as ‘Nambu Magariya’ or the ‘Nambu Bent-House’ which was very popular in Nambu clan Morioka Domain during Edo period. The building is divided into two parts, namely Shimote and Honya, which are connected at right angles to each other thereby giving the building its distinctive L-shape or key-shape structure. 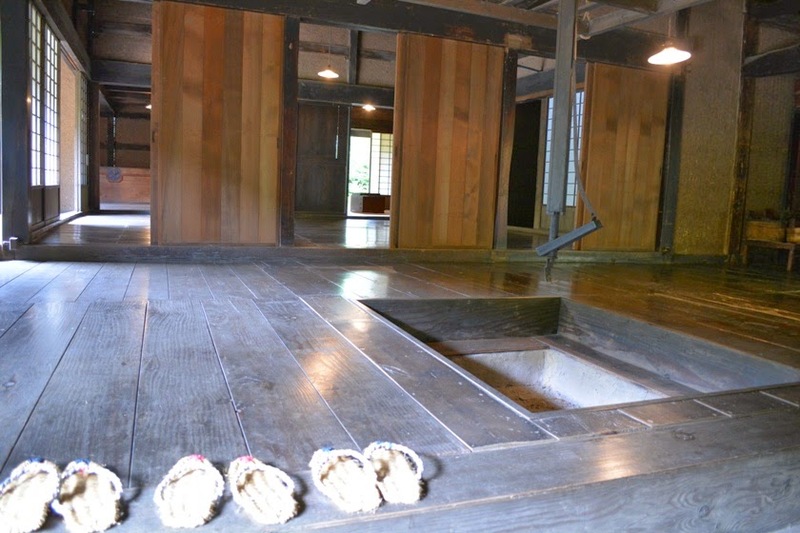 Shimote consists of Umaya horse stable room and Doma earthen-floor room. Honya or Omoya is the main living area of the house. 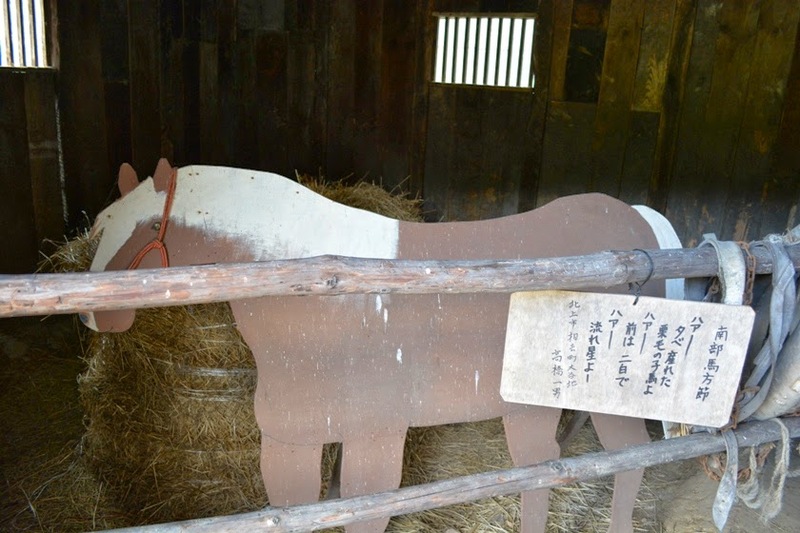 Horses were regarded as members of the family and had to be seen from the main house. We loved viewing the L-shaped architecture of the building and took several photos of the building from various positions and angles. 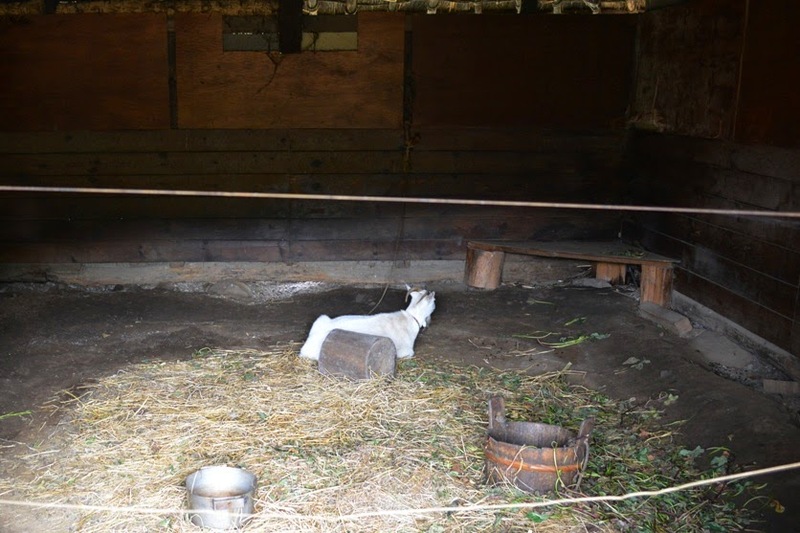 Inside the Shimote part of the house, we saw a goat in Umaya horse stable room. 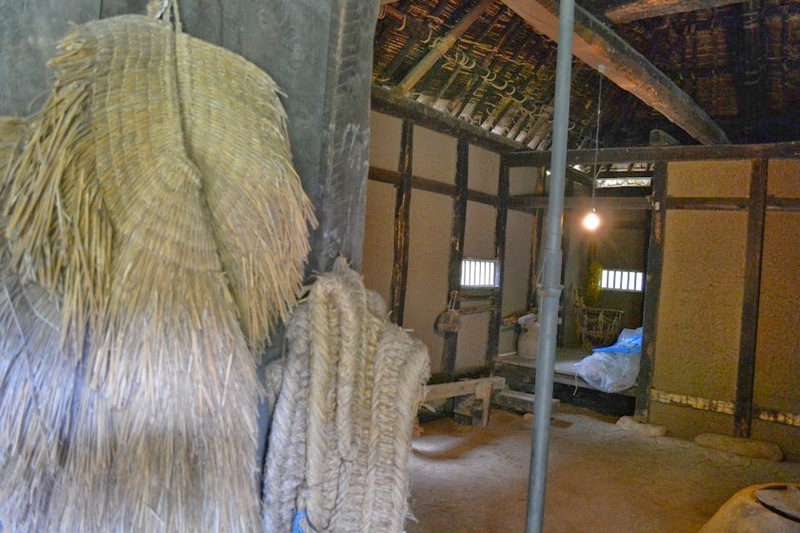 In Doma earthen-floor room, we saw various farming tools along with a Mino straw coat. 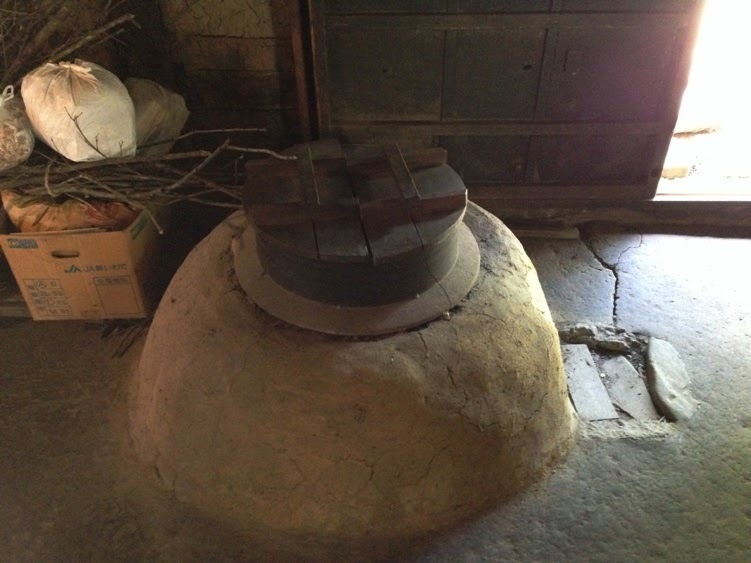 In addition, in the kitchen area in Doma room, we saw a Kamado stove and wooden Usu mortars for pounding rice. 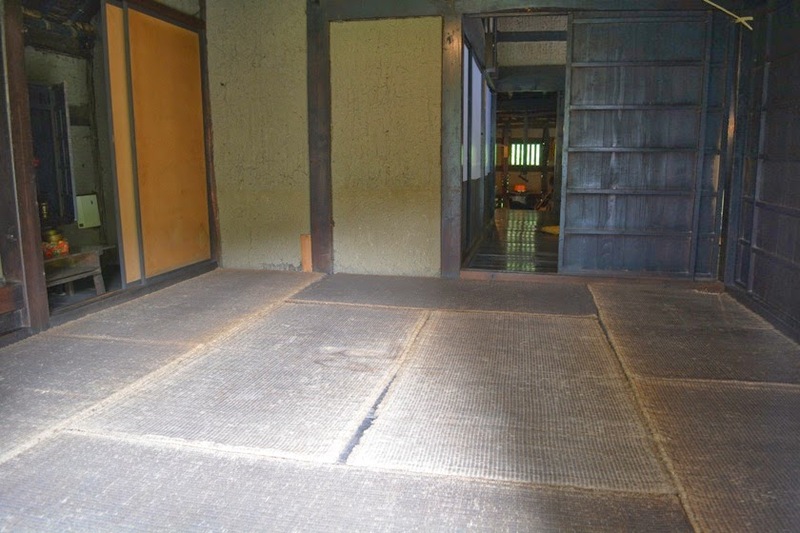 In the Omoya part of the house we saw a living room with Tatami mats and another room with Irori hearth. 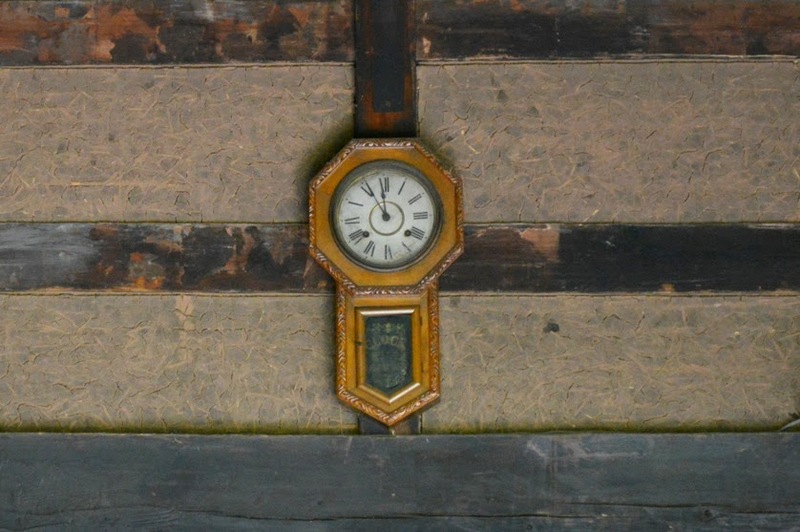 We took a few photos of the artifacts kept inside the house. 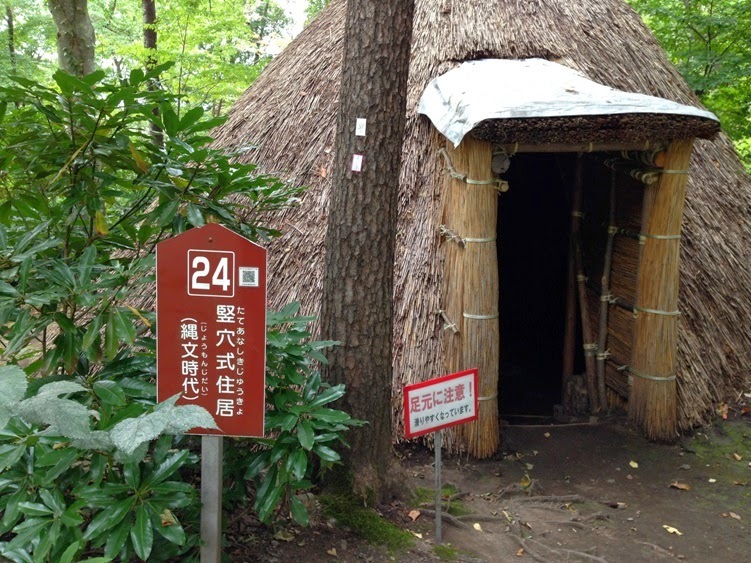 We walked along the paved pathway for about one minute or so, and saw an interesting hut structure named ‘Tateana Shiki Jukyo - Muromachi Jidai’ or the ‘Pit-House Dwelling from Muromachi period’. The hut is a replica. Presently, it is unclear whether this hut was a residential dwelling or some other building. 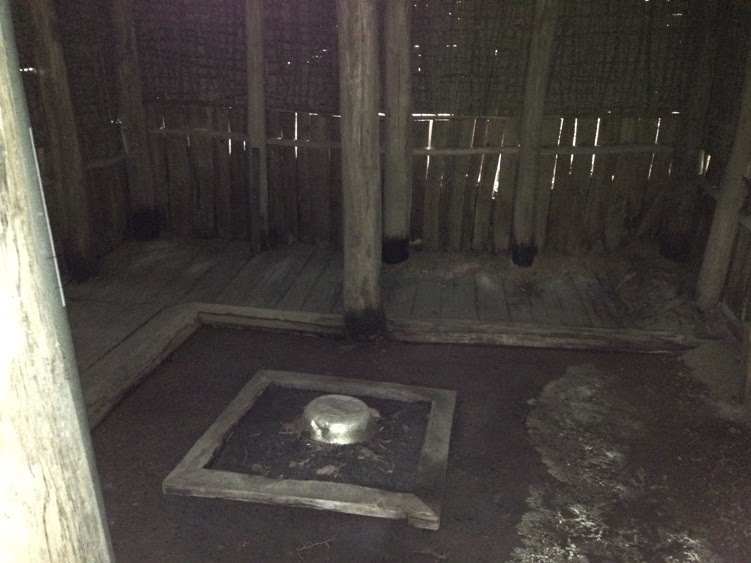 The hut is rectangular in shape and has many wooden pillars supporting the structure. 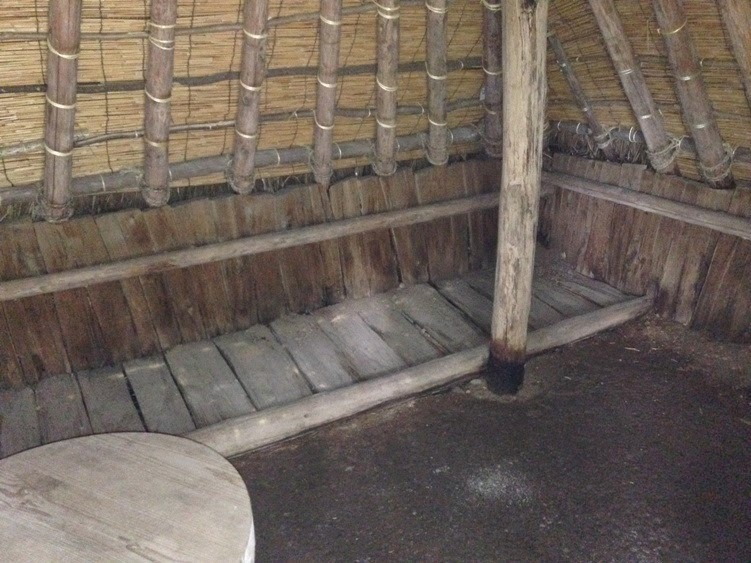 The characteristic feature of the hut is that it has a protruding entrance. 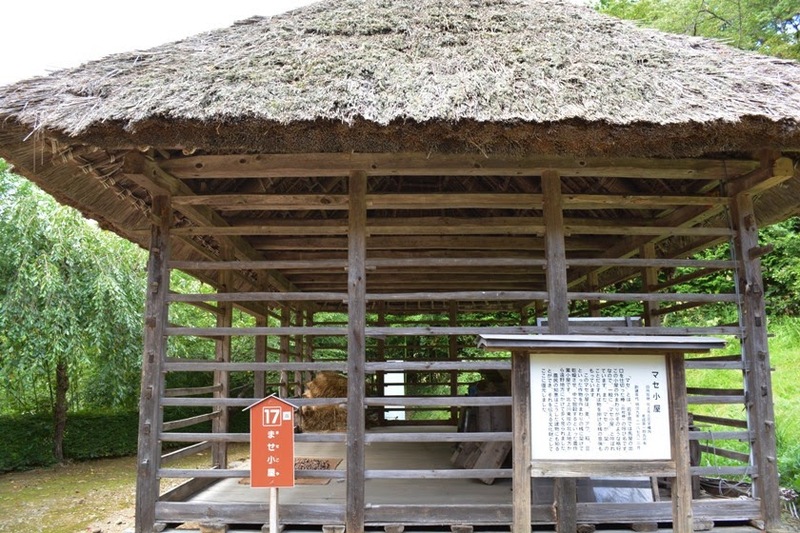 Adjacent to the above hut, we saw another interesting hut structure named ‘Tateana Shiki Jukyo - Heian Jidai’ or the ‘Pit-House Dwelling from Heian period’. 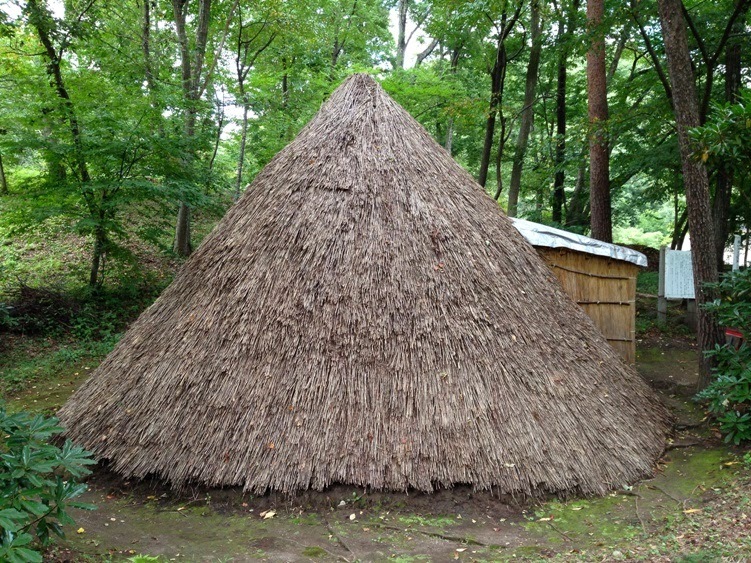 This hut is a replica that was restored on the basis of the excavation examples of the ruins found in a place called Kasaidan in Aisari-cho of Kitakami City. 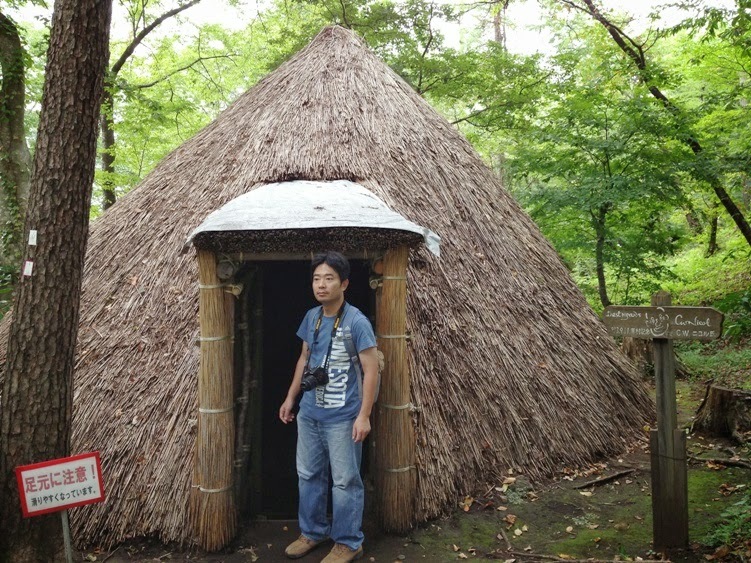 The characteristic feature of the hut is that the main entrance area has Kirizuma gabled-roof type structure. We entered the hut and saw four pillars supporting the roof. We also saw a Kamado stove alongside the wall. I loved this hut structure because it reminded me of the huts that I saw in my childhood in India. 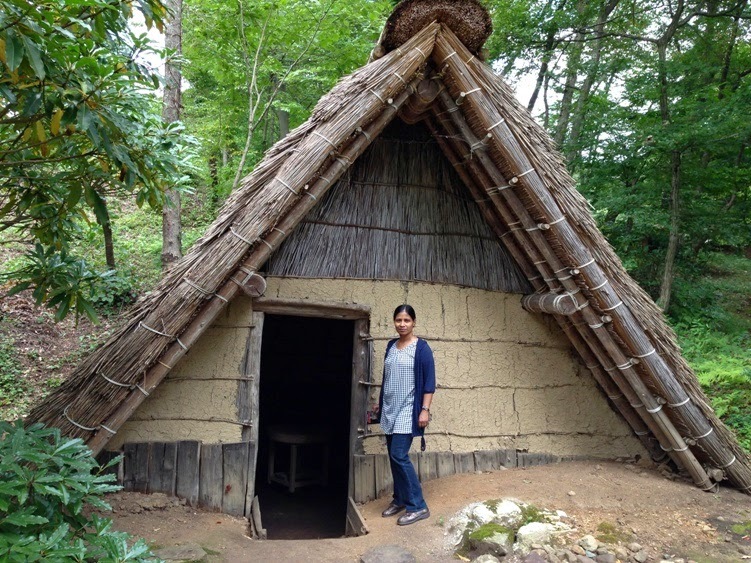 We continued walking along the paved pathway for about 30 meters and saw yet another hut structure named ‘Tateana Shiki Jukyo - Jomon Jidai’ or the ‘Pit-House Dwelling from Jomon period’. Inside the hut, the environment is cool in summer and warm in winter. 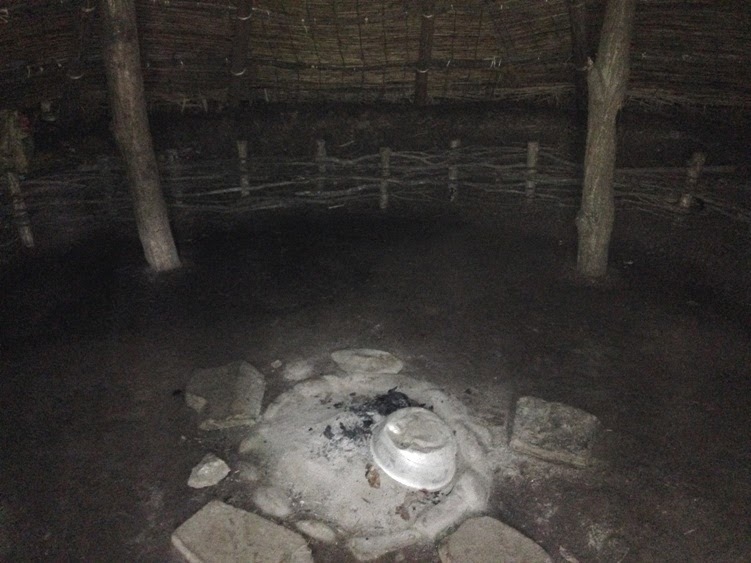 This kind of hut was the typical residence of the common people from the beginning of Jomon period about 10000 years ago to the end of Heian period about 800 years ago. 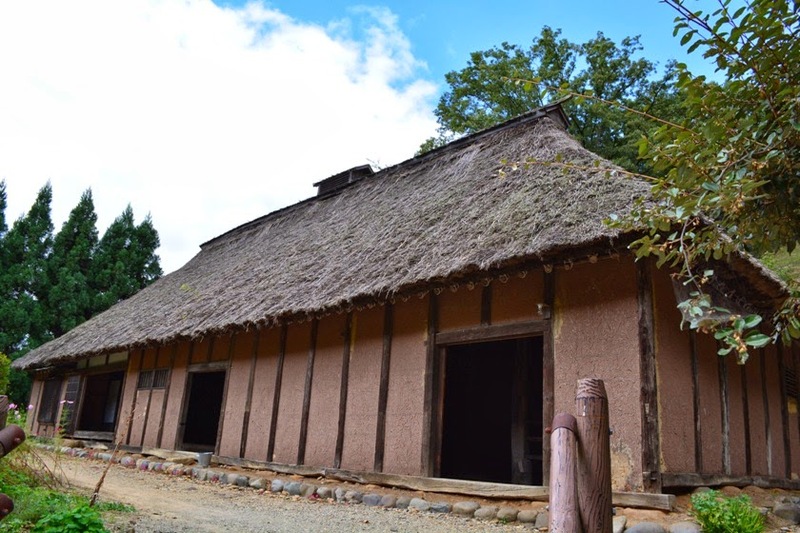 This hut is a replica that was restored on the basis of the excavation examples of the ruins from the late Jomon period (about 2500 years ago) that have been found in a place called Ainosawa inside Michinoku Folklore Village. I have actually seen huts with similar structure during my childhood in India. Next, we started walking back towards the car parking area. 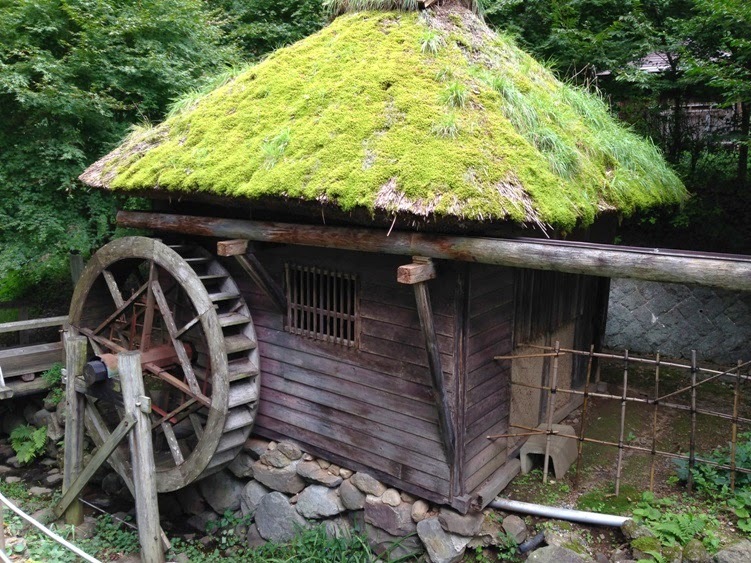 Towards the northern end of the open-air museum, we saw a small building named ‘Suisha Goya’ or the ‘Water Mill’. This building was originally located in a place called Tatsusobe in Miyamori-cho of Tono City. It was constructed in the end of Taisho period. 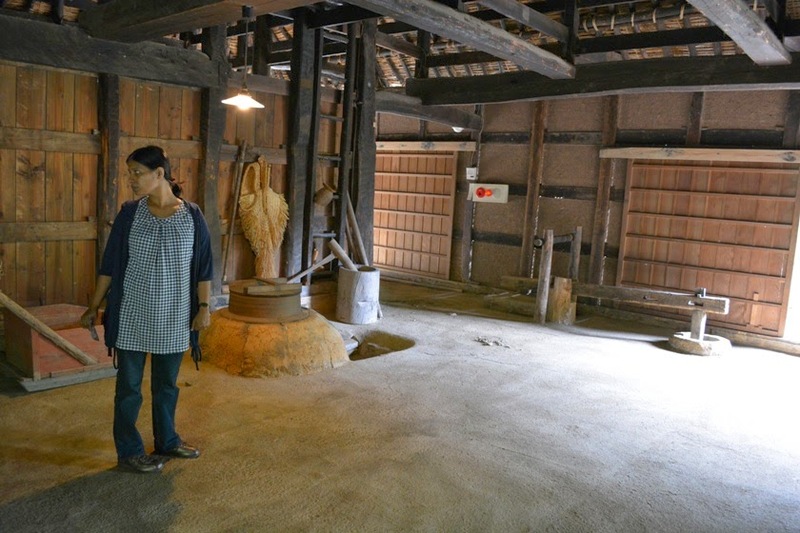 It was used for milling rice and wheat. The entire village cooperated and shared this water mill. 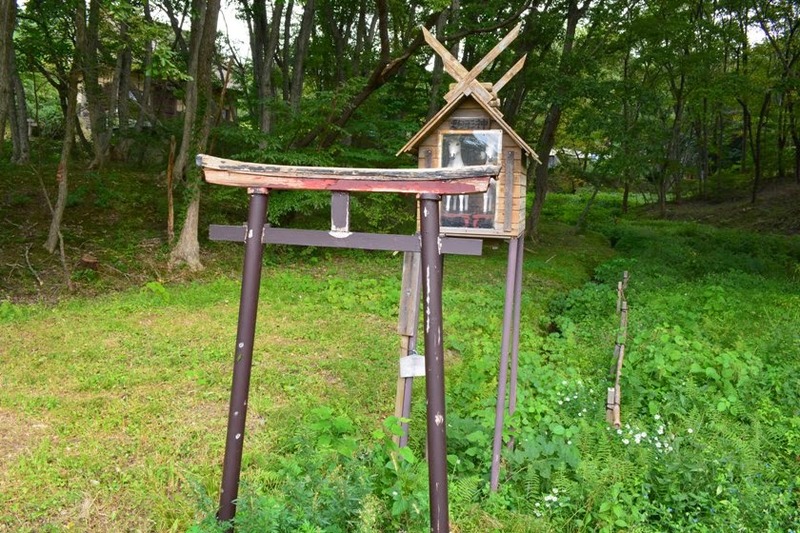 It is said that water mill was brought to this region during the middle of Edo period. At this point, we finished our tour of Michinoku Folklore Village. 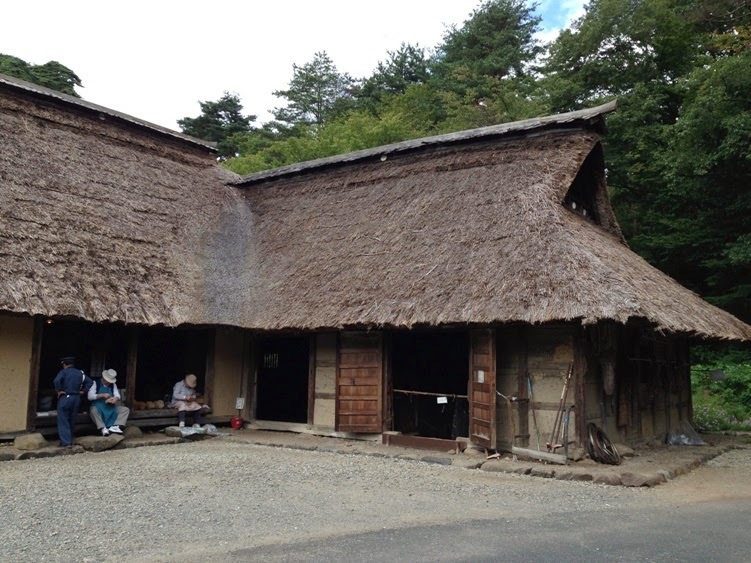 We loved viewing many old buildings from the bygone era in this open-air museum in Kitakami City. Our visit to the museum was very interesting and educational for us. Afterwards, we drove for about 3 hours and returned home.